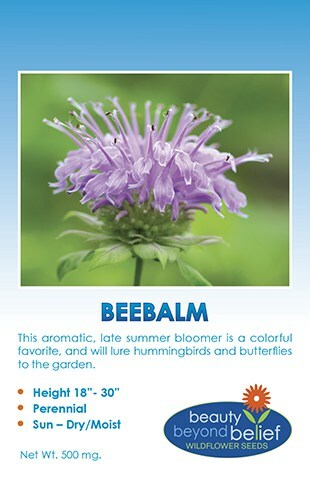 Mountain Beebalm is an aromatic, late summer bloomer is a colorful favorite with purple flower clusters on top of sturdy stalks, and will lure hummingbirds, butterflies and other pollinators to the garden. This clump-forming species will take some time to germinate and may flower the second year after becoming well-established. 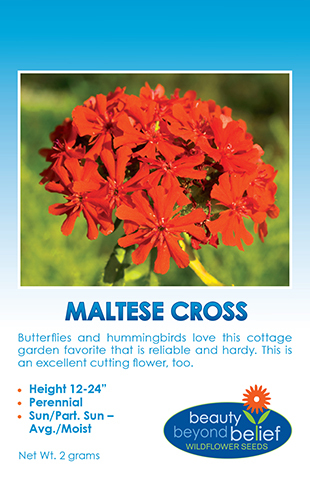 This aromatic, late summer bloomer is a colorful favorite with purple flower clusters on top of sturdy stalks, and will lure hummingbirds, butterflies and other pollinators to the garden. Mountain Beebalm is a clump-forming species that will take some time to germinate and may flower the second year after becoming well-established. Monarda or Mountain Beebalm (Monarda fistulosa) also know as Wild Bergamont, continuously shows up in so many of the lists of Garden Plants for Bees as well as lists of Native Plants for Bees. Beebalm is an aromatic, perennial herb native to Eastern North America, grown for its colorful blooms and edible and herbal usefulness. It grows in dry thickets, clearings and woodland edges from Ontario and British Columbia to Georgia and Mexico. Like all plants in the mint family, Beebalm has a square stem. The hard, branching, 2 – 3 foot stem has showy, red, pink, or lilac flowers in large heads or whorls of about 20-50 flowers supported by leafy bracts of pale green. Monarda fistulosa provides excellent long-blooming, mid to late summer forage for native bees. Mondarda didyma the red flowering Beebalm is great for attracting hummingbirds but bees have a harder time managing the longer tubes of the florets. Beebalm is easily grown in many soil types and is tolerant of heavy clays and can grow in sunny or partially sunny locations. It is a good candidate for slopes and areas set aside for pollinator habitats at the edge of windbreaks and fence rows. The roots are creeping rhizomes that can be easily divided for propagation. This spreading perennial prefers moist soil, but is quite drought tolerant once established. Monarda species should be maintained to avoid becoming invasive and dividing the plant clumps every few years will help to avoid problems with powdery mildew. The seeds can be sown outside in the spring, 2 weeks before the average last frost date or in the late summer, 2 months before the average first frost date. The plants can be started indoors 8 – 10 weeks before the last frost. Sow 1/16 to 1/8 inch deep and thin to 12 inches apart. Sprouts will emerge within 5-10 days. Monarda is a wonderfully fragrant plant and has been traditionally been used by Native Americans as well as currently as a tea, flavoring and also for treating stomach and bronchial afflictions. The flowers and leaves can be used for tea either fresh or dried. Different species of Monarda have different fragrances and flavors. The flowers can be torn apart and used as a colorful and flavorful garnish for salads or beverages. Save the leaves for tea. Dry bunches in a well ventilated area and save for sachets and potpourris. Monarda is also a great companion plant for tomatoes! Remember to include this hardy species in your sequentially blooming planting mix in order to provide flowering plants throughout the growing season to establish a pollinator-friendly habitat in your area.